Palm Beach and Martin Counties, Florida Palm Beach and Martin Counties, Florida U-Pick farms: Find a pick your own farm near you in Palm Beach and Martin Counties, Florida for fruit, vegetables, pumpkins, organic foods,local produce and more! 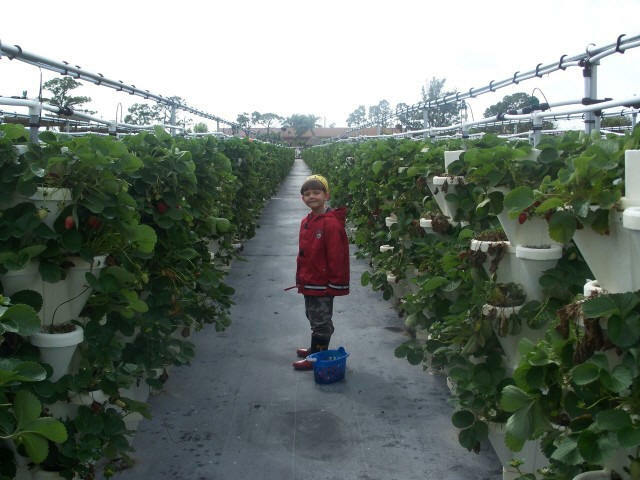 Looking for a local, pick-your-own farm in Palm Beach and Martin Counties, Florida? Scroll down this page and you will see the U-Pick farms in Palm Beach and Martin Counties, Florida, sorted by county. Those that offer organic or sustainably grown produce are identified by the words "organic" and/or "sustainable" in Green, next to their name (see "What does Organic mean?"). The U-pick crops they offer follow the name of the farm. To search the page for a specific crop, use Ctrl-F (or on an ipad or Mac, use their "search on this page" function) If they have a website, the name will be in blue and underlined; click on it and it will open their website. If you find anything outdated or inaccurate, see the customer and farmer menus (as appropriate) at the top menu bar to submit updates and corrections and help me keep each current! D and D Family Farms - 2018 - PERMANENTLY CLOSED: In late 2017, they put this notice on their Facebook page :We are permanently closed. We no longer operating a farm. Thank you for all your patronage." 5059 Sw Citrus Blvd, Palm City, FL 34990. Click here for our Facebook page. 10790 SW Amaryliss Avenue, Indiantown, FL 34966. Phone: 772-260-7487. Email: [email protected]. Open: Call before you go - I haven't had an update from this farm in years and there is nothing current about them on the internet; (Does anyone have current information, are they still offering pick your own? If so, please write me! ); all the other websites are simply copying what I report, so don't trust them if they say this farm is open - call the farm yourself before you go. Directions: New Location 200 feet off State Road 710. From Indiantown travel 5 miles NW on State Road 710. One half mile beyond the entrance to FPL's Martin Power Plant, which is marked by a flashing yellow traffic light, turn left on Amaryliss Ave. Use caution crossing the Railroad tracks. Look Both Ways Twice. There is no gate or signal. Turn left immediately after crossing tracks. Nov. thru June. Crops are usually available in November. Payment: Cash, only. Hydroponically grown in vertical stacks: Strawberries, Tomatoes, Peppers, Beans, Broccoli. U Pick Standing Up. Clean family fun. Comments from a visitor on April 18, 2010: "Sunday April 17th, 2010 I called the farm today to verify their hours of operation and found out the farm was closed for business. Their crop froze in the frosty weather earlier this year and they had no comment about when they were going to open again." 12033 State Road #7, Boynton Beach, FL 33467. Phone: 561-733-5490. Fax: 561-733-5492. Email: [email protected]. Open: See our website for current hours. Directions: 12033 State Road #7, Boynton Beach, FL. South of Boynton Beach Blvd, North of Atlantic Avenue on the west side of SR 7 (Hwy 441). Click here for a map and directions. Payment: Cash, Debit cards, Visa/MasterCard, Discover, AmEx. Click here for our Facebook page. Minimizes chemical and pesticide use, strawberries, tomatoes, snacks and refreshment stand, restrooms, tiki picnic area, face painting, birthday parties, school tours, tractor pulled Hay Ride, tractor churned home-made ice cream. Seasonal U-Pick Strawberries, Cucumbers, Tomatoes, and Sunflowers. Comments from a visitor on March 18, 2010: "it is wonderful very friendly. they have restrooms..snacks..picnic tables..they do take credit..and they do field trips for kids"
15550 Okeechobee Blvd, Loxahatchee, FL 33470. Phone: (561) 441-6156. Alternate Phone: 561-795-3399. Email: [email protected]. Open: Tuesday to Friday, from 10 am to 6 pm; Saturday and Sunday, from 9 am to 5 pm; October 15th until May Closed Mondays. Directions: From I-95: Take Okeechobee Blvd, West to Royal Palm Beach, continue west to the corner of B Road and Okeechobee. From Florida's Turnpike: Get off at the Okeechobee Exit, Head west to Royal Palm Beach, continue to the corner of B Road and Okeechobee. Click here for a map and directions. Strawberries: End of November to April; Tomatoes: End of November to May Various other vegetables all season long. Payment: Cash, Check, Debit cards, Visa/MasterCard, Discover. 13940 182nd Court North, Jupiter, FL 33478. Phone: 561-746-8935. Email: [email protected]. Directions: I-95 to Indiantown Road - West to 137th Trail - Right - first left (182nd Ct.N.) second house on the left. Open: appointment only! Payment: Cash, only. Picking season for lychee and longhans from the last week in May until the fruits are gone (usually in July); We sell out fast; We also have about 30 different varieties of other fruits to see and taste; See our trees now at YouTube. Payment: Cash, only. Comments from a visitor on November 11, 2009: "I have a blog post that reviews this farm. Click here! " Feedback from a visitor, February 18, 2008: "This is such a wonderful treat to have new to Palm Beach county! Though small, this u-pick is convenient and has very friendly staff. Finding it is somewhat deceiving because the u-pick is entered through the store front of a strip mall. There is also a farm stand a couple hundred feet north on Military trail called The Boys Farmstand. Enjoy!" Another visitor supplied the photo above and has a blog with a description of her visit with here son on this page.